Is it time to evaluate (or reevaluate) the fire sprinkler systems in your high-rise building or retrofit project? How do you choose between a steel fire sprinkler system, polypropylene (PPR), and chlorinated polyvinyl chloride (CPVC)? 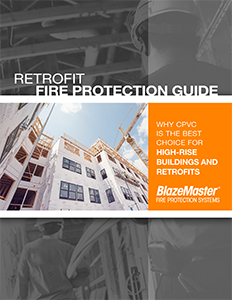 CPVC fire sprinkler systems are a reliable choice for residential fire sprinkler systems, and our free “Retrofit Fire Protection Guide” shows why BlazeMaster® Fire Protection Systems have been the trusted name in non-metallic fire protection for more than 30 years. The distinct advantages CPVC has over steel, like its light weight and corrosion resistance. A description of where CPVC outperforms PPR, including easier installation and cost savings. How BlazeMaster CPVC pipes and fittings are specially engineered to not sustain a flame. Myths about CPVC and how the material’s performance proves them wrong. A case study on how a BlazeMaster CPVC fire sprinkler system provided reliability and peace of mind to residential building tenants.